We’re still excited about Target’s newly-launched home decor line, Project 62—and now, the retailer is upping its game in the furnishings department once again. The retail giant’s much-anticipated collaboration with everyone’s favorite design couple (and stars of Fixer Upper, RIP) Chip and Joanna Gaines is officially here. As of November 5, the Hearth & Hand with Magnolia collection is available at Target stores nationwide, as well as online. The line includes over 300 items, spanning tabletop accessories, larger decor items, and linens. (How chic are those grey and white striped napkins?) And while the full collection ranges from $0.99 to $129.99, most items are under $30. The same can be said for Chip & Jo’s Target collection. It includes several holiday-themed offerings, but there are plenty of timeless pieces that work year-round. 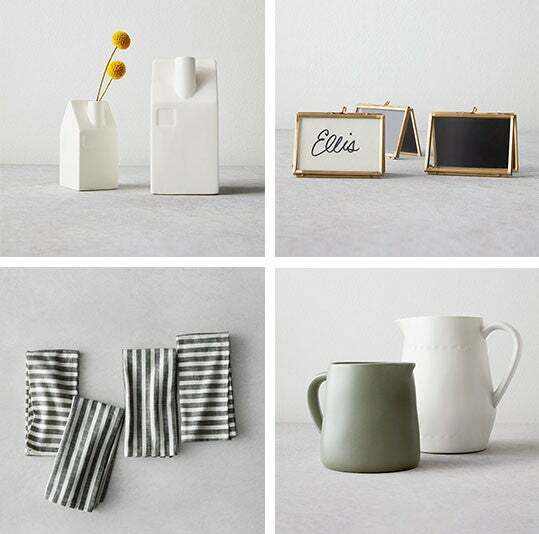 Choose anything from stoneware kitchen necessities to simple but elegant home textiles (and view some of our favorites from the Hearth & Hand line here). This focus on helping communities is definitely at the forefront of this partnership. For starters, Magnolia will work with Target House—an apartment-style, long-term housing facility that provides free lodging to patients and families of patients at St. Jude’s Children’s Research Hospital—at the hospital to redesign the living room in time for the holidays. And in even more good news, the collection isn’t a limited edition, one-time thing. That’s right: You’ll be able to shop exclusive Magnolia-designed pieces at Target stores nationwide for multiple years to come. Looking to add a bit of that modern farmhouse feel to your own homes? Head to Target.com to shop the collection now.